It’s easy to panic. Don’t. 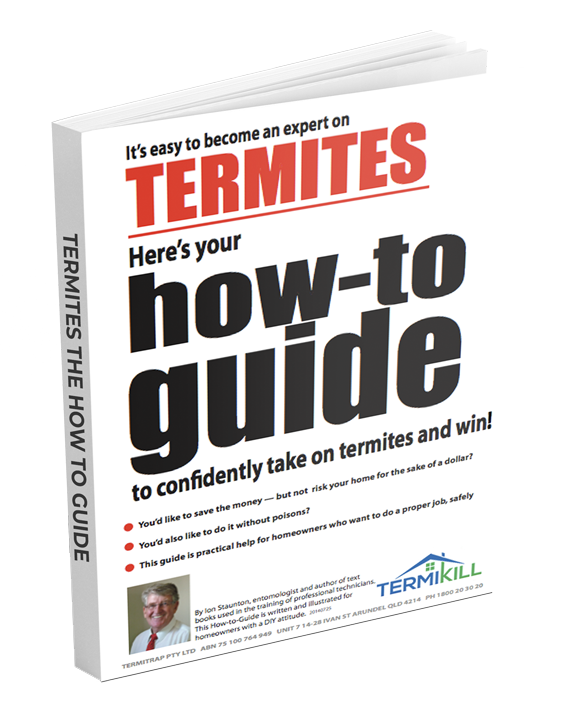 Termites eat slowly and will not cause significant damage in the couple of days it takes you to research their identity and find out the best response in your situation. Many homeowners are tempted to do something, anything, immediately… and this could cost you money you didn’t need to spend or, lose you the opportunity to do the simple treatment. Before you decide whether you call in a professional or do it yourself, read on to see what is involved. Sure the professionals are really good at what they do and if things are really complicated you might decide paying the extra is the sensible thing. However, our products have been successfully used by thousands of homeowners over the years because we’ve simplified the process of using decoy monitors and baiting. And, at any time during your DIY effort, you can phone and talk to a real person who will listen to your problem, ask a couple of questions and get you back on track. This section is on killing termites so we begin with baiting but also cover the physical discovery and destruction of nests in mounds, trees, etc. Baiting only works if termites can safely enter a caché of bait from undisturbed timber where they are working and feeding quite happily. 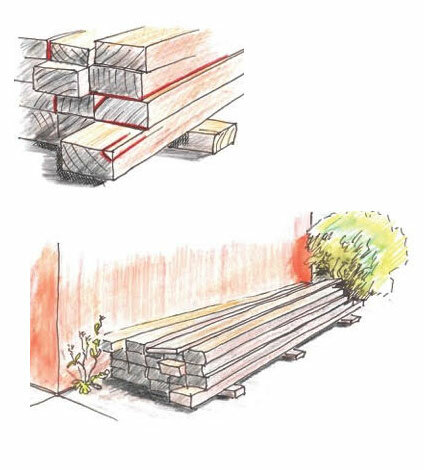 Check for any hollow timbers in the timbers you can reach in your home. As termites usually come from soil level and work upwards, badly disturbed workings often isolate any termites that were working above the damage, say in a door lintel or the roof. Baiting them above disturbed areas will not be successful if termites cannot traverse back to their nest. If adjoining undamaged timbers containing living, working termites are found, a small 5-10mm hole is made. Use a small-bladed screwdriver or a vegetable knife—NOT A DRILL AND BIT. Bait is then attached to the outside of the timber so the workers can get through the hole you’ve made, directly into the bait and take it back to their nest. The more caches the better, but they should not be placed on the same piece of timber or closer than 1 metre apart. Caches should be checked about every 14 days or so and bait added if necessary. If you’ve ripped apart the timber and sprayed everything that moved, you may have killed thousands of workers and soldiers but the colony survives and may come again from another direction. Setting Traps around the outside of the building could intercept termites which have just been deprived of the house they were eating. Placing Traps closer together outside affected rooms can result in one or two of them being discovered so feeding can begin again —this time outside! It takes time to get sufficient bait back to kill off a nest. Baiting in multiple places accelerates the demise. Nests usually receive unbaited food from other areas of the colony. This means it will usually take at least a month, sometimes several months, to kill off a large colony. Once baiting is started, it is very important not to do any gardening or landscaping or anything that may cut through any termite tunnels between the feeding site and the nest. Tunnels are mostly in the top 50-75 mm of soil. The first deaths from baiting probably won’t occur for a few days after ingestion. You can observe the bait in the caché dwindling as it is taken away and then, when more bait is added, it gradually disappears as well. While replenishing the bait, workers and some soldiers will be seen scurrying through the mass of the white bait. Towards the end of the process, lesser numbers will be seen. A couple of weeks of no observed life indicates the colony is dead —UNLESS someone or something has severed the tunnels going back to the nest. The rule is: tools down! 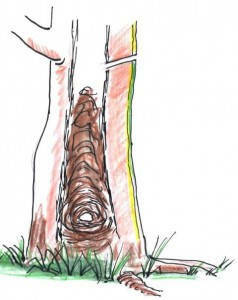 You may be able to reduce the time it takes if you check nearby hollow trees for termites. Killing a tree nest is quick (see below) and, if that’s where the activity is coming from, it would stop within a couple of weeks. If activity continues after your tree treatment, there must be another nest. Baiting is the best, maybe only, option. Our Bait, Chlorfluazuron is an Insect Growth Regulator or IGR that interferes with the production of the new outer shell during the moulting process. They die. Also, the queen lays eggs that don’t hatch. Termites of all castes cannot moult once fed bait, but it is the large-scale death of thousands of nymphs from decomposition gases and rampant fungus that is the usual cause of the colony’s demise. The chlorfluazuron has no effect on humans, pets, birds or wildlife. Chlorfluazuron is mixed in with powdered cellulose which is the basic component of wood and once activated with water which turns it to the consistency of mashed potato or porridge, the termites find it quite palatable and much easier to harvest. Our bait is the same as is used by professionals but is registered and approved by the APVMA in Canberra for use by homeowners —because it is so safe. Professionals have access to dusts and foams to apply into the termite galleries which kill more quickly by poisoning the individual termite. As they die, they are cannibalised and the cannibals die, etc., until the poison gets back to the main nest where the nymphs and royals also die. The time taken is 1-2 weeks, BUT, if the dusting/foaming application is overdone or disturbs the process, termites will seal off the affected gallery. It is very easy to jump to a false assumption if on later inspection there are no active termites —but it may not be because the colony is dead. A few weeks or a few months later, termites could show up in another part of the building. If you’ve found them in garden mulch, wood scraps or firewood, in a fence or a retaining wall or inside a tree or stump, they may also be the serious ones —or nuisances that you shouldn’t waste money on. Live termites found scurrying through mulch, leaf litter, in a load of firewood, etc, are not in a situation where they are able to be baited. Plenty of people have placed bait in mulch where they saw termites —but it doesn’t work. Probably because the termites could not secure the bait from ants or, they didn’t have secure tunnel access. The best procedure is to place multiple Traps in the area and wait for them to access the Traps in their usual way. These items are made of solid wood and therefore the termites may well be Coptos or Schedos. They could also be one of the not-so-serious termites covered above. We recommend getting them identified; they won’t eat much in the few days or hours it takes. 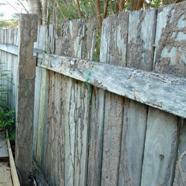 Photos not only of the soldiers but also of the mud on the fence, wall or timber can be a useful aid to identification. We can then advise the best treatment method. DO NOT LIFT OFF the top pieces of timber. You will not be able to replace it so the the termites will resume eating. They will seal their access to the area you exposed even if only momentarily. Make a small opening into the wood where it is hollow —almost paper thin. 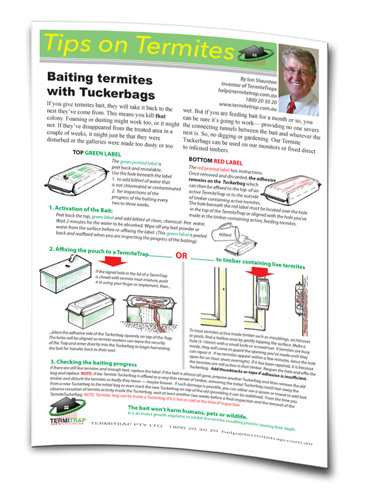 If you see live termites busy inside and working away happily, prepare the Tuckerbag Bait by adding water then align the hole in the Tuckerbag with the hole you’ve just made and stick the bag to the timber. If the timber surface does not allow good adhesion, you can hold the bag in place with tape or tacks. 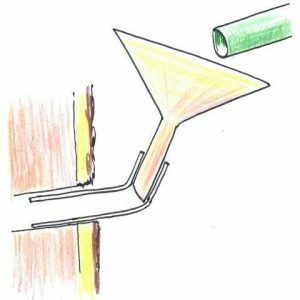 If you cant find a hollow area, you should be able to find some termite ‘mud’ sealing off splits, cracks or gaps between the timbers. Carefully remove some of the mud until you have broken through into the activity, the affix the Tuckerbag. This diagram shows like places where gaps might be. 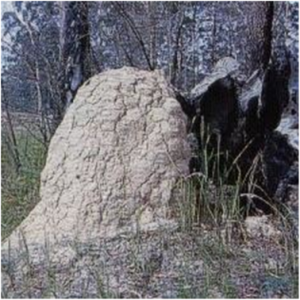 Termites that build mounds are subterranean but not included in the termites that do 99% of the $damage to homes. This is because mounds are very visible, not tolerated around buildings and it is very easy to kill these colonies by physically destroying the mound. If you are on an acreage property, make it your rule not to allow any mounds to develop within 100 metres of a building or other structure. If you live in suburbia and there are no mounds in your backyard, take a glance over your fences to see if the neighbours have mounds. A 50 metre travel to your home would not be out of the question. Use a crowbar, a pick/mattock to break open the top/sides. The outer is often very hard. The less dense and crumbly interior is easier to break. The queen and the nursery are at the base of the mound and if you can’t physically get down there, use 30-50 litres of the dilute insecticidal mixture of permethrin, chlorpyrifos or a bifenthrin concentrate which can be purchased from a local hardware store. These insecticides may be known by various brand names but the active ingredients are on the front panel of the label. Although not highly toxic, they are poisons and you should read the label for dilution and safety directions. Using a watering can/bucket, pour at least 30-50 litres of solution down into the mound. It’s more important to use high volume than a high concentration. You want it to percolate all the way down to the bottom to kill off the queen. The colony will be re-built in weeks if you don’t. There is not much need to do anything about those big brown nests up in the branches of trees. These termites are either feeding on the decaying interior of the tree or they build tunnels down the outside which then radiate out in many directions (often on top of the ground) to grass and leaf litter. If you can easily reach the nest, physically destroy is as for mounds built on the ground, otherwise you can keep breaking their tunnels and maybe spray insecticide around the base of the tree to eventually ‘starve’ them out. You could of course, get an arborist to climb up and cut the nest out. You could even drill into the trunk of the tree and inject bifenthrin by following the instructions in this section. Just because you have mounds, it doesn’t mean the other, more significant Coptos and Schedos aren’t around. You should consider putting TermiteTrap monitors out to intercept them just in case they are. Coptos and Schedos often build their nest inside hollow trees and stumps. So do a few other species, but as it is very easy to kill termite nests inside trees, it should be done no matter which species it is. 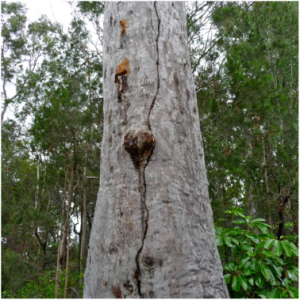 The treatment will not kill the tree and, although insecticides are used, they are poured down the inside of the tree and remain there away from people, pets and wildlife. Follow label instructions on dilution and the use of protective procedures. The insecticide inside the tree will last for about 10 years but setting Traps around the buildings is still recommended because termites don’t only set up nests in trees —and we know for sure, termites are in your neighborhood! These are probably Heterotermes which are more interested in the fungus growing on the surface of timber such as paling fences, sleepers in retaining walls, etc. 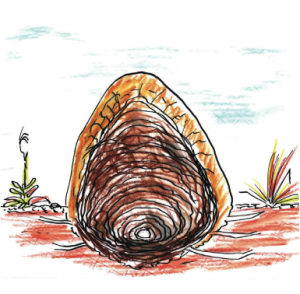 They come from the soil and they certainly have been known to find a way inside a house through weepholes. 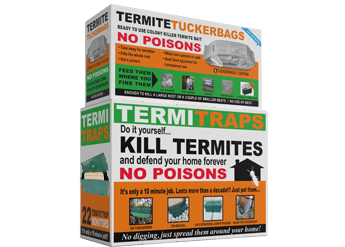 They seldom get into an outside monitor and the Tuckerbag Termite Bait is of little use as they don’t build a substantial nest. Probably the easiest way to kill them is to brush off the plastered ‘mud’mixture and spray the area with a bifenthrin or permethrin solution made from a concentrate bought from your local hardware store. You should also apply a high volume along the line where the fence touches the ground and particularly around the posts. This is best done with a watering can so there is no droplet drift and the soil is saturated. The residue in the soil will last for about 5-10 years. And, because you can’t be sure you’ve actually killed the nest by destroying thousands of soldiers and workers, you should inspect the area (and your house) every 3 months for the next year. Re-do if necessary. You can use our Photo ID service to help you in identifying your termites. The Giant Northern Termite Mastotermes darwiniensis destroys houses, trees, vehicle tyres (yes, rubber tyres!) and many other materials, faster than any other termite. They don’t cause the most dollars worth of damage in Australia; that title goes to the Coptos, simply because Coptos are distributed over all the mainland (including where Mastos thrive) and consequently they run up their dollars in the high population cities/suburbs. Identification is pretty easy: Mastos are 13-15mm long (that’s more than half an inch). Most other termites are less than 10mm. They don’t build big mounds; those magnetic (north-south) mounds up your way are grass eaters. Mastos are easy to entice into monitors. Inspect monitors every month as they eat quickly. If you find live Mastos, the IGR (chloruazuron) baits are ineffective. You will need to call in a professional who will probably use a fipronil product. If you are apprehensive of chemicals, do not worry unduly. Fipronil is the chemical in Frontline which is put directly onto the skin of dogs to kill and prevent fleas, so the usual dilution of 3 ml/litre of fipronil is even less toxic.